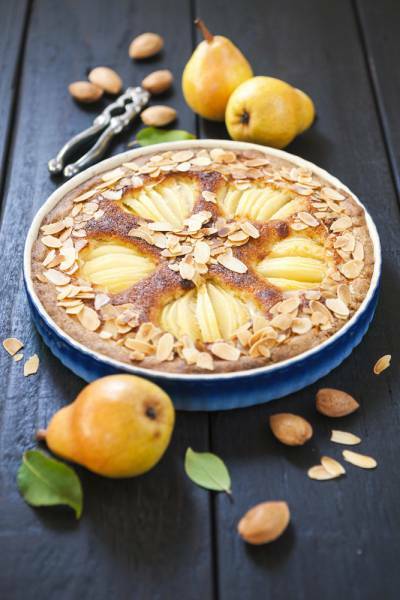 A poached pear and almond sponge tart served with clotted cream. Scrape the seeds from the vanilla pod, cut the butter into small cubes and place in a bowl. Add the flour and the sugar. Rub together with the tips of your fingers until the mixture resembles breadcrumbs. Add the egg and bring the mix together until it forms a ball. Roll the pastry out between 2 sheets of baking paper to 5mm thick. Transfer the pastry to the tart case and trim the edges. Line with baking parchment and cover with baking beans. Transfer to the oven and blind bake for 20 minutes until golden brown. Peel the pears, and remove the core using a Parisienne scoop. Place the wine, water, sugar, vanilla, pears and spices in a pot, slowly bring to the boil. Reduce the heat and simmer for 45 minutes or until the pears are tender. Allow to cool in the liquor. Once cool, remove pears, quarter, and drain well in kitchen paper. Mix the flour and ground almond together in a bowl. Cream the butter and sugar together in a mixer or food processor until pale and fluffy. Add one third of the dry mix followed by half the eggs, then another third of the dry mix, then the rest of the eggs followed by the last of the dry. Mix just until this makes one smooth batter. Allow the blind baked tart case to cool before putting a 1-2 cm thick layer of the frangipane on the bottom. Line the sliced pears going from the center of the tart to the edge in 6 equal slices. Put back in the oven and drop the temperature to 170 degrees for about 20-30 min. Check sponge with a wooden skewer until dry. When the tart is cooked, allow to cool for 30 min and then glaze the top with apricot jam. Cut into 6 slices and serve with clotted cream.